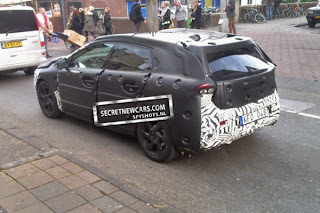 Spies have caught the first pictures of Volvo's upcoming wagon en-route to the UK via The Netherlands. 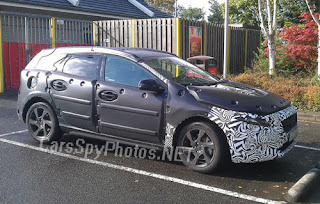 Snapped in a McDonalds car park, the five-door wagon will sit above the C30 hatchback but below the aging V50. The newcomer will sit on the front-wheel-drive 'P1' structure, shared with the S40, V50, and C30 and is pencilled for a 2013 market launch. Internal sources have hinted that Volvo have longed for a C-segment competitor since it last launched the 440 in the '90s. The compact wagon was even pushed ahead of the aging XC90 in the marque's product cycle. Volvo CEO, Stefan Jacoby, said the new model would “be a derivation of the C30 - a Golf competitor” and will be aimed at young, active families. If given an AWD set-up, the vehicle would appeal to U.S shoppers, a market in which Volvo is wanting to expand in. Down the line, a compact SUV, called XC30, to rival the Audi Q3 and BMW X1 will hit the market. Two variant may be on offer; a standard wheelbase model and a long-wheelbase variant to target Chinese customers, and possibly, American customers. Power for the V30 will come from a range of new VEA (Volvo Environmental Architecture) 4-cylinder engines that will have a cubic capacity of under 2,000cc.